Kim says her hat is a little too short, which I suspected might be a problem. Here’s the thing — when I started making the decreases, I was worried I would run out of yarn (I also did the decreases two or three times because I was having problems) even though I also knd of felt that the hat might be too short. Moral of the story: Believe the measurements. Trust the yarn. If I had not freaked out about running out of yarn then the hat would have been fine, AND I would have had enough yarn, because I had enough left over. Sorry Kim! Posted in Finished Objects 2006, Hats, Uncategorized at May 2nd, 2006. Pattern:I started with the calculations from this site, and then I ended up switching to the instructions on Crazy Aunt Purl’s site here. Needles: Most of it was done on Clover 9 circular (24″) and then at the end I also used Balene 9 circular (16″) as well. Skills learned: How to decrease using two needles instead of double-pointed needles. (I had a tough time with the double-pointed needles for Francisco’s hat, so I decided to try the two-needle method. ); Using markers to mark decreases. Other thoughts: This yarn has many ply (eight, maybe? ), so it’s easy to split. If you don’t watch carfeully, you only pull the yarn through some of the loops, so it gets splitty. On the other hand, the yarn has a nice, dry hand (now I sound like a wine critic), and feels smooth and crisp. Also, it is machine washable, so that’s a plus. Posted in Finished Objects 2006, Hats, Uncategorized at April 16th, 2006. It’s almost a finished object! Because all it needs is weaving in of the ends and a washing and a blocking. Needles: Clover circulars in size 9 and 10.5 for the body and Balene circulars in 9 for the neck and armhole. Skills learned: Picking up stitches, casting off loosely, slanted decreases facing right and left, increasing in circular garment knitting, three-needle bind off (for shoulder seams). Other thoughts: This was a good first sweater project because it was pretty easy. Only problem was the nasty cast off. And now it’s fixed! Also the bottom of the armhold is a little loose, but that’s okay. Click through for more views of the sweater. Posted in Finished Objects 2006, Sweaters, Uncategorized at April 9th, 2006. 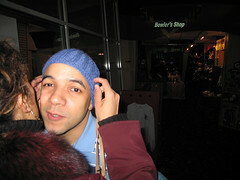 Here’s F-Ro wearing the first hat I ever knit. 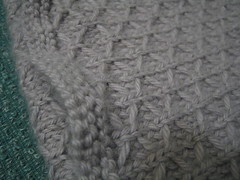 I didn’t use a pattern–I just winged it using some number 8 circular needles and sport-weight wool-ease. The top is a little messed up, due to the lack of pattern, but all in all, I think it fits pretty well! Posted in Finished Objects 2006, Hats, Uncategorized at March 8th, 2006. This scarf used Knitpicks Ambrosia (which my co-worker pointed out was described in the catalog as “yarn for the gods.”) Knitpicks.com is a great source for well-priced yarn (prices start at $1.79 for pure wool per skein) — this is from their luxury yarn line (a mix of baby alpaca and cashmere), which is nice for a scarf because it’s right next to the skin. It will fuzz up when put next to a man’s chin, because of their stubble, but I think the fuzziness is a nice element of the finished scarf. It’s 60 inches, and took six weeks, and used five and a half skeins. 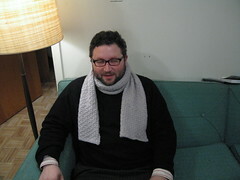 Posted in Finished Objects 2006, Scarves, Uncategorized at February 19th, 2006. A. making a Dr. Evil face, while wearing the Lattice Scarf. 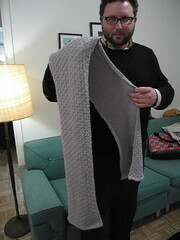 Here’s Adam showing off 60 hours and 60 inches of scarf (and love!). Doesn’t he look thrilled?